This lab/workshop is in the G&L building. Leo sold Fender to CBS in 1965. Between then, and starting G&L in 1979, Leo worked with Music Man (formerly Tri-Sonic, then Musitek, Inc) although much of what he did was as a ‘silent partner’ due to a 10-year non-compete clause in the CBS sale. 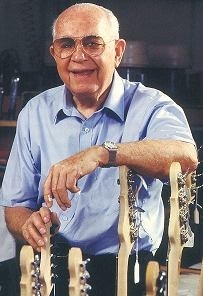 Leo Fender died in 1991 and G&L have kept his lab as it was when he last worked there. In this video (no sound for most of its length), you can see around Leo’s lab and get an idea of how he worked (messily, mostly). Personally, I think Leo’s nature as a tinkerer and experimenter is very clear from the video and I can’t watch it enough times.